Ms. Alpa Sheth, M/s VMS Consultants Pvt. Ltd, Mumbai presented a talk on June 20th in the Department of Civil Engineering, Indian Institute of Science. Prof. C S Manohar, Chairman of the Department presided over the function. 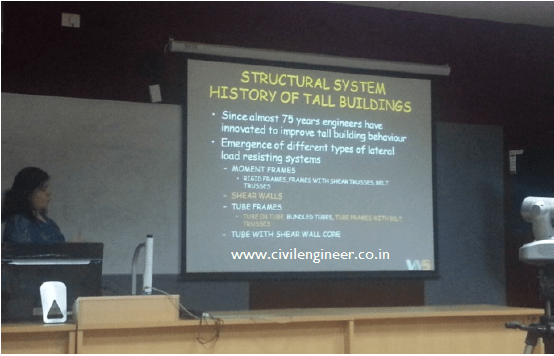 The talk discussed the numerous parameters that govern the behaviour of tall buildings and how to select an appropriate structural system for tall buildings. The talk started out with discussing what was different about the design of tall buildings as against a regular building and how lateral forces played a very important part in its design. Each of the parameters such as strength, stiffness and geometry were discussed in detail enumerating with examples the various ways they were tackled in different projects, designed by her office or a well-known project across the world that the students could identify with. The talk also touched upon how to carry out wind tunnels studies, why they were important and what were the different types of wind studies that could be done abound how they have helped optimize projects worldwide. The talk took several structural systems such as Frames + shear wall core, Tube systems + shear wall core, tube in tube, Shear Walls system and so on showing their applications in different projects and the advantages and shortcomings of each of the systems.